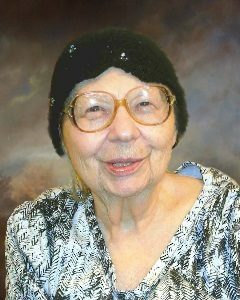 Clariss Bachmann, age 98, of Norwood Young America, Minnesota, passed away on Sunday, December 2, 2018, at Good Samaritan Society in Waconia, Minnesota. Mass of Christian Burial will be held Friday, December 7, 2018, 11:00 A.M. at Church of the Ascension in Norwood Young America, Minnesota, with interment following at the church cemetery. Visitation will be held Friday, December 7, 2018, from 10:00-11:00 A.M., one hour prior the service at the church. Clariss Catherine (Glatzel) Bachmann was born on September 27, 1920, in Lester Prairie, Minnesota. She was the daughter of Edward and Hannah (Klancke) Glatzel. Clariss was baptized as an infant on October 31, 1920, by Father A. J. Losleben and later was confirmed in her faith as a youth on July 21, 1937, both at Church of the Ascension in Norwood Young America, Minnesota. She received her education in Norwood Young America, graduating with the Central High School Class of 1938. On October 21, 1961, Clariss was united in marriage to Wilfred Bachmann by Father Russel at Church of the Ascension in Norwood Young America. Clariss and Wilfred made their home in Norwood Young America. They shared almost 52 years of marriage until Wilfred passed away on October 12, 2013. In addition to being a loving wife and homemaker, Clariss worked at Bongards Creamery in Bongards, Minnesota, as a bookkeeper. She was a lifelong active member of Church of the Ascension, where she was part of the perpetual adoration. Clariss was an only child. She enjoyed playing 500, and traveling which included every state in the United States of America and seven countries. She felt honored to have celebrated 50 years of marriage. Clariss cherished the time spent with family and friends. Clariss passed away on Sunday, December 2, 2018, at the Good Samaritan Society in Waconia, Minnesota, at the age of 98 years, 2 months and 5 days. Nephews, Nieces, Other relatives and friends. Clariss is preceded in death by her Parents, Edward and Hannah Glatzel; Husband, Wilfred Bachmann; Brothers-In-Law, Herman Bachmann and his wife, Grace, Henry Bachmann and his wife, Lorna; Sister-In-Law, Ruth Bachmann. I am so sorry we will not be able to attend the funeral. God bless to Clarris! Our Sympathy to Orville and friends of Clariss. May God Comfort you in your time of sorrow.